Historical textiles suffer from deterioration due to exposure to uncontrolled environmental conditions, in museums. 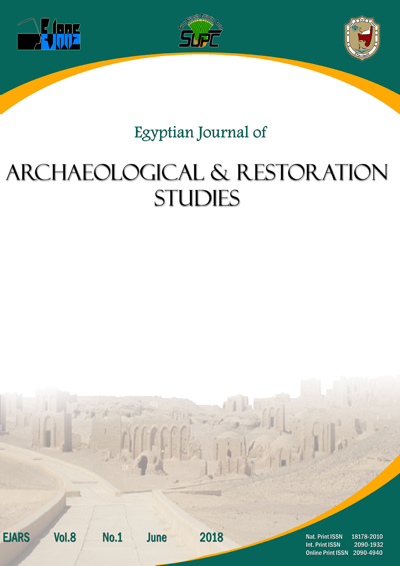 This article presents strategies for the conservation and storage processes of historical textiles that have been under uncontrolled storage conditions and display, in Egypt. The object dates back to the Ottoman period. Its dimensions are 62×49.5 cm. The textile object is highly decorated with figures of plant, and is multicolored in red, blue, and black. The textile has various types of deterioration such as dust, blue stain, loss of parts and weakened fiber. The study addresses three objectives: first, documenting the objects by using SEM Documentation, FTIR, EDS, Visual documentation, Biological examination, Photograph documentation was carried out in order to develop a plan of conservation treatment. The effects of cleaning materials on the natural dyes were tested. Second, the conservation treatment processes were done, old conservation repairs were removed, and separated parts were supported. Cleaning included mechanical and wet cleaning. The textile was supported by a new linen fabric. Third, an excellent storage system was established in order to keep the object on the long-term storage.